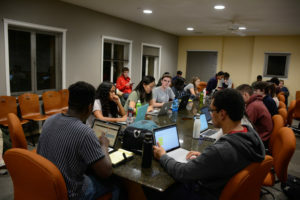 The resolution — co-authored by Senators Kimiko Hirota ’20, Erica Scott ’20, Katie Hufker ’18, Hamzeh Daoud ’20, Deputy Chair Remy Gordon ’20 and 18th Undergraduate Chair Shanta Katipamula ’19 — identifies various issues with the Campus Climate Survey, which was first administered in 2015. According to the new resolution, the survey failed to collect data on several issues, including the location of sexual assaults on campus, incapacitation by alcohol or drug use and non-physical forms of partner abuse such as emotional and economic abuse. Because the first Town Hall to address issues with the 2015 survey was not held until last week, Stanford Association of Students for Sexual Assault Prevention (ASAP) leaders Jacqueline Lin ’18 and Stephanie Pham ’18 urged the Senate to pass the resolution and the administration to hold off on administering a survey until the students’ desired improvements are made. In addition, the resolution proposes that the Campus Climate Survey Committee be made permanent and expanded to include greater student representation. Specifically, the resolution recommended that students from the sociology and psychology departments be included, as their expertise would be of use in crafting an effective survey. The Senate also introduced a joint resolution in support of continuing an Introduction to Disability Studies course. The resolution, authored by Hufker, calls on the Undergraduate Senate and the Graduate Student Council to actively ally with Stanford’s disability community. According to Executive Cabinet disability lead Bryce Tuttle ’20, the class was successfully introduced during fall quarter. Thirty students completed the course, breaking the original enrollment cap of 24. Despite the class’ debut success, however, Tuttle stated that there is not yet a provision to require teaching it again in the future. Tuttle said he believes that Stanford needs to ensure commitment to not only the field of disabilities studies, but also the disability community itself, which comprises between 12 and 17 percent of Stanford’s student body, according to the Office of Accessible Education. Senate Chair Kojoh Atta ’20 echoed this sentiment. “I always think it’s good when Stanford and other elite institutions are really highlighting the struggles and identities of marginalized communities,” Atta said. The Undergraduate Senate will be voting on both the Campus Climate Survey and disability course resolutions during its 21st meeting next week. An earlier version of this article incorrectly stated that a total of fifteen graduate students signed two letters to the administration in support of the AAU survey. In fact, a total of 215, not fifteen, graduate students signed the letters. The Daily regrets this error.